Get more versed with the Legendary King through Samurai Gamers' Thane Hero Guide. Our guide includes Thane's strengths, weaknesses and item builds. Thane is a tank who excels in initiating team fights and supporting his team with crowd control. He is quite durable and able to lock down enemies by chaining his abilities. This allows allies to move in after to finish the target off for easy kills. Good at Initiating – Thane excels at bringing the fight to the enemy. Valiant Charge allows him to suppress enemies in front of him and knock them up at the end of its effect. Good Thane players can pick off high priority targets with Valiant Charge and follow with Avalon’s Fury to continue the crowd control. Excellent Crowd Control – Thane’s Valiant Charge and Avalon’s Fury are excellent abilities for providing crowd control during team fights. You can potentially knock up and stun most of the enemy team with a well-timed combo, leaving them susceptible to your team’s follow up damage. Good Finisher – Thane’s King’s Glory is a great way to finish off opponents as it deals true damage and cannot be interrupted. This is especially effective against low health enemies, dealing more damage and preventing their survival. Ability Dependent – Thane needs to hit his intended targets with his abilities to maximize his contribution to team fights. His auto attacks lack impact, so he will be rather useless when all of his skills are on cooldown. Team Dependent – Since Thane excels in creating team fights, he needs his team to follow up on his initiates. He is very weak when alone, lacking the damage to really presure any opponents. Thane is best suited to acting as a roaming support, needing back up damage to be effective. Gank often, using Thane’s prolonged crowd control to lock the opponent down. Start with a level in Valiant Charge and use it whenever you see an opening to catch your lane opponent off guard. Next, take a level in Avalon’s Fury and level it up to max first. Both of Thane’s abilities scale similarly, but he will be using Avalon’s Fury more frequently. Finally, whenever you can, level up King’s Glory. This ability can deal massive amounts of damage and is especially dangerous against low health enemies. Solo Fights: Thane is not great at dueling and should avoid doing so whenever possible. Stun the enemy with Avalon’s Fury before rushing away with Valiant Charge. Team Fights: Thane is an excellent initiator thanks to his abilities. Your job is to bring the fight to the opposing team. Lead in with Valiant Charge and hit as many opponents as possible. Follow up with Avalon’s Fury. If any enemies are low, follow up with King’s Glory to finish them off. Continue to control enemies with your abilities whenever possible, taking as much damage for the team as possible. Direct Valiant Charge in the direction you want to escape when a team fight is not going your way. During a losing team fight, do your best to help your team escape. You can do this by using Avalon’s Fury to disable your enemies before disengaging with Valiant Charge. Royal Power (Passive) – When Thane’s HP falls below 30%, he regenerates 24% of his maximum HP over 4 seconds. Also grants 25% damage reduction while active. 75-second cooldown. Royal Power allows Thane to remain in the lane or team fights. This is especially true when you build him into a tanky initiator. Once he gets into the fray, he can soak damage for his team while waiting for his abilities to get off cooldown and use them again to disable the opposing team. This makes Thane extremely durable when facing sustained damage dealers. The damage reduction comes by surprise and can really throw off their rhythm. Valiant Charge – Thane charges forward, knocking enemies back and dealing 60/75/90/105/120/135 (+0.35 AD)ˀ physical damage each hit. Valiant Charge’s final hit will also knock enemies into the air. Valiant Charge is Thane’s primary ability. This allows him to start team fights, break through the enemy’s front line, and knock up high priority targets. Defensively, Valiant Charge is a good escape ability, since it covers a large distance. Avalon’s Fury – Thane strikes the ground, dealing 200/260/320/380/440/500 (+0.58 AD) physical damage to enemies within range. He also knocks enemies into the air and slows their movement speed by 90% for 2 seconds. This ability is great during ganks and team fights due to its potential to knock up multiple enemies at one time. 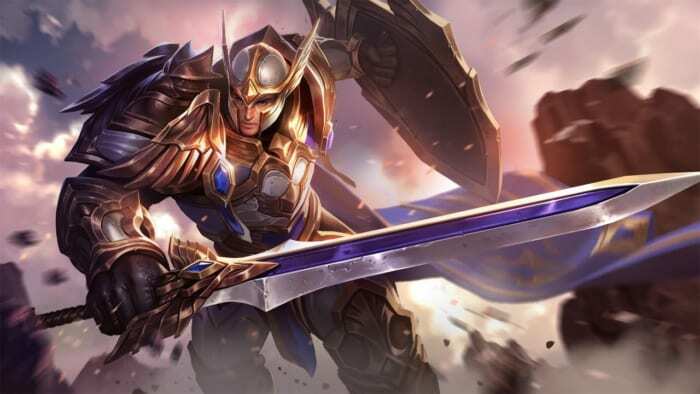 Avalon’s Fury complements Valiant Charge’s knock up, especially during team fights, to further disable either the enemy front line or quickly eliminate the back line. King’s Glory – Thane charges for a short time, then unleashes a powerful blow in a frontal cone, dealing 500/750/1000 (+0.9 AD) true damage to enemies in the area. Also, deals 15% of targets’ lost HP as physical damage. Thane gains 20% damage reduction and cannot be interrupted while charging the ability. King’s Glory gives you an ability that can instantly eliminate enemies who have less than half of their full health. Once you’ve begun charging King’s Glory, enemies cannot disable you – use this to your advantage, especially in team fights. Thane’s basic combo is using his Valiant Charge into Avalon’s Fury. Once you dodge his Valiant Charge, he will have difficulty landing his Avalon’s Fury. Always watch out for his Valiant Charge as this is his primary way to initiate. When in critical health, try to move sideways to avoid King’s Glory. This ability has a long range that can instantly kill low health foes. Thane usually runs an Arcana set which improves his tankiness. Such sets include Indomitable, Benevolence, and Crusader. He can also run an AD-centric Arcana setup that has Onslaught, Assassinate, and Skewer. This allows him to deal more damage with his abilities and normal attacks. Thane does decently well against other tanks. Given that his kit relies on initiating, he often needs to use his abilities first to sway team fights in his team’s favor. Otherwise, Thane and other tanks are often equal during the laning phase. Thane can handle warriors well, thanks to Valiant Charge and Avalon’s Fury. However, Thane needs to farm for his items first, and some warriors have abilities that are geared towards single-target damage. It is best to pick your battles against warriors carefully. Thane does well against assassins. Given that Thane’s abilities allow him to disrupt opponents, he can handily disable assassins and win skirmishes. However, if assassins get their items early, Thane might have a hard time dealing with these highly elusive and high-damage dealing threats. Mages are generally squishy targets and are highly susceptible to crowd control. As Thane, be alert when using your Valiant Charge and Avalon’s Fury against mages. You can either press the attack first to not let them get the chance to use their spells, or dodge their abilities counterattack with your skill combos. Similar to mages, while marksmen have high damage output, once you get close to them they are quite squishy. As Thane, enemy marksmen are your top priority during team fights. As such, use your Valiant Charge and Avalon’s Fury combo on them to make them vulnerable. Then finish them off with King’s Glory. Thane struggles a bit against support heroes who have stuns or movement-impairing abilities. However, against other support heroes, it is best to clash with a team mate so that they can follow up with damage after you’ve initiated a skirmish.